In the beginning, there was endpoint management and there was mobile device management (MDM). They required separate products because desktop computers and laptops were so different from smartphones and tablets. Then, consolidated endpoint management came with the second wave. The processes and workflows for desktop computers, laptops, smartphones and tablets were still different and separate, but at least admins could execute them from a single console. Now is the time of the third wave, and unified endpoint management (UEM) lets admins use the same processes to enroll, inventory, manage and secure all devices from a single product. This paper explores the evolution of UEM and the most useful characteristics in a UEM product. 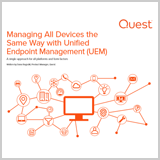 Readers will take away ideas on unifying endpoint management for all devices in their organizations. As IT shifts from stationary desktops to roaming laptops, tablets, and smartphones, many organizations are finding the tools they once relied on are no longer enough.